Earlier this year, I was contacted by Chinet and asked to try out their disposable bakeware. I instantly fell in love, and told everyone I knew about it because it is so convenient. The bakeware is made of 90% recycled materials and is non-stick and disposable. And to make it even better, it can go from oven to table to freezer to microwave! With the holidays coming up, Chinet asked if I wanted to give away another set to which I said, of course! To enter to win, leave a comment stating what holiday dish you think this bakeware would be perfect for. 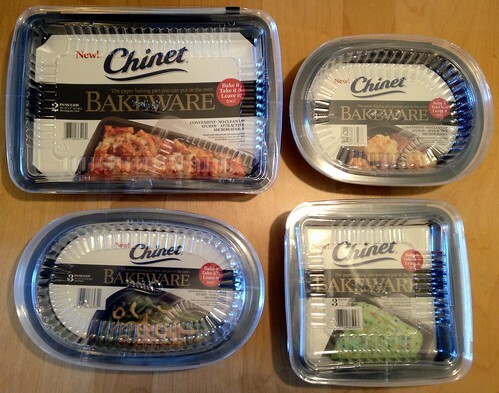 Chinet provided me with a complete set of Chinet Bakeware and will ship a second set directly to a winner. Giveaway ends at 11:59 p.m. EST on Sunday, November 18, 2012. One winner will be selected at random shortly thereafter and contacted by email. Please note this giveaway is only open to residents of the U.S. I totally see my Pumpkin Bars in either the large rectangle or small square dish. I can see my YiaYia’s Baklava I make in either of the bakeware. She’d be so happy. 🙂 I learned from the best. Brownies would be awesome to give to a friend in one of those! My mother’s recipe parmesan onions! Garlic mashed potatoes and chocolate lava cake! This bakeware would be PERFECT for my apple crisp with cinnamon streusel. It’s my go-to fall/winter dish and I love making it for friends and family. The Chinet bakeware would make this super convenient for me. Disposable bakeware is always best when bringing a dish to someone else’s house. I’m already signed up for a sweet potato souffle! Lasagna would be delicious in these! My stuffed shells, either my cheese or my turkey spinach stuffed shells would be perfect for the pans. When I arrive at my daughter’s house we can reheat them and serve them in the same pan! It looks like I could do most of my sides at Thanksgiving–sweet potatoes, corn pudding, mac and cheese. These would be perfect for my cinnamon rolls. Mashed potatoes and beef casserole in the square one. Butternut squash lasagna in the 13×9 and spinach gratin and dinner rolls in the smaller sizes. I have to manage a Thanksgiving meal for 8 hosted by my friend whose cooking leaves something to be desired (she admits it herself! ), thus I’ve been asked to make and bring a bunch of the dishes the day of. These would be fantastic for transporting the goods on the big day! Disposable bakeware – How fantastic. It will be perfect for my sweet potato casserole. My home made Stuffing or my Pumpkin bars with cream cheese icing would work perfect in these !! Oh! Can you share the butternut squash lasagna recipe?! Sounds great. The pans would be perfect for bringing in brownies to my office! These pans would be fab for so many things! The larger ones great for office holiday party items – I wouldn’t be freaking out that I left my good serving dish behind! And the smaller dishes are the perfect size for when we make food for our “Angel Tree” recipients – great to make & donate…. It would be perfect for the cornbread dressing and pies I’m making for our “Friendsgiving” this year! Looks great for transporting brownies! What a great giveaway! I would love to bake and bring blondies to parties in these containers 🙂 Thanks for the chance to win! Ooo, what wouldn’t travel great in those. I’m thinking a plan ahead breakfast item like French Toast Souffle. An Apple & Cherry Slab Pie in the 13 x 9. Breakfast casseroles woiuld be great also, would be a lot lighter to carry. Red velvet cake….. perfect for a holiday party! I’d make pecan pie bars, for sure!